Oh dear. That face looks too ugly and too happy. A face that ugly shouldn't look that happy. It is, of course, a deep sea fish that lives in such darkness that it has no idea how ugly we find it. It probably wouldn't care, anyway. Ugly is simply what they do down there. 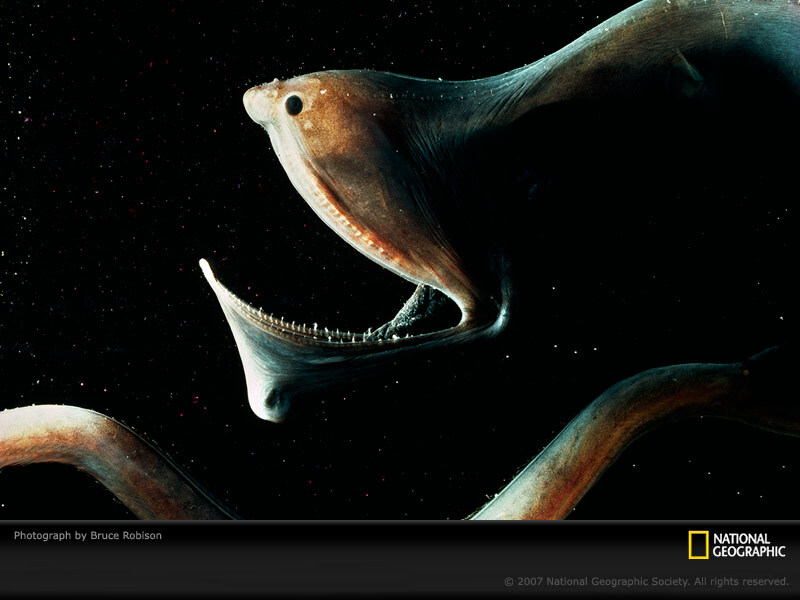 What we have here is a Gulper Eel. 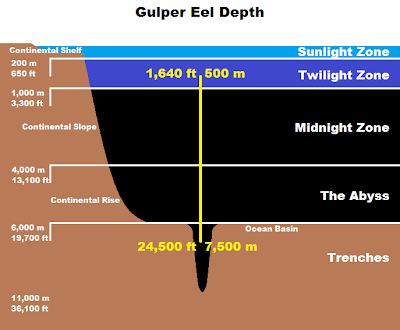 Indeed, one particular kind of Gulper Eel. They aren't considered true eels, although they are much more closely related to them than a lot of other long, thin fish that get called eels. 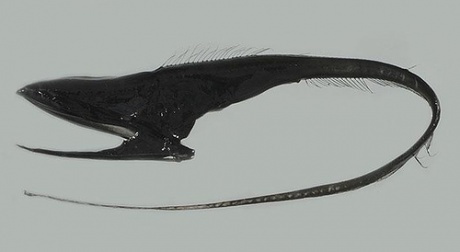 Very few of those other fish could be quite as long and thin as a Gulper Eel. The front end is dominated by a gigantic gob, the rest attenuates into a minimalist tail that can take up more than half the animal's entire length. But what do I mean by "one particular kind of Gulper Eel"? The Gulper Eel that I've always known and loved is the one also known as the Pelican Eel or sometimes the Umbrella Mouth Gulper. Umbrellas and pelicans are far too mundane to have floating around with this bizarre creature, whereas "gulp" is one of those great little Germanic words which is satisfyingly dirty and guttural. On the other hand there is the Latin name Eurypharynx pelecanoides, and there is indeed just the one species of Pelican Eel. They naturally get their name, all their names, from the incredible extent to which their jaws can open. Their stomach looks PUNY compared to the volume of stuff they can hold in their jaws. In fact, their mouth can open wide enough to swallow things BIGGER than itself! Which is... good? Their stomach can also expand to hold whatever their mouth can hold, which I'm sure is really useful. Never bite off more than you can chew, except they don't bite bits off or chew, they just swallow. This brings us to an interesting fact about their teeth - they're tiny. Many deep sea fish have big, long teeth to impale and trap other fish or squid, but Pelican Eels can't do that. It's thought that they may eat crustaceans far more often, with fish and cephalopods being a rare treat. A bit like our very own Stoplight Loosejaw. After the massive mouth and the stomach which may or may not be bulging grotesquely, there is the long, thin tail which is used to swim. There is a light emitting organ right at the end, meaning that it's possible that this eel gets into some weird positions to hold the tip of its tail right near its mouth to attract prey. Along its sides is the lateral line, hairs that detect vibrations and movement around it. Pelican Eels don't have them in grooves like most other fish, they instead stand right out into the water, probably aiding in sensitivity. Tropical and subtropical waters across the world are graced with this morbid beast of hunger. They have no scales, no pelvic fins and no swim bladder. They can reach a metre in length and usually live at depths of 1200 - 1400 m (4,000 - 4,600 feet), although they can range well beyond that. 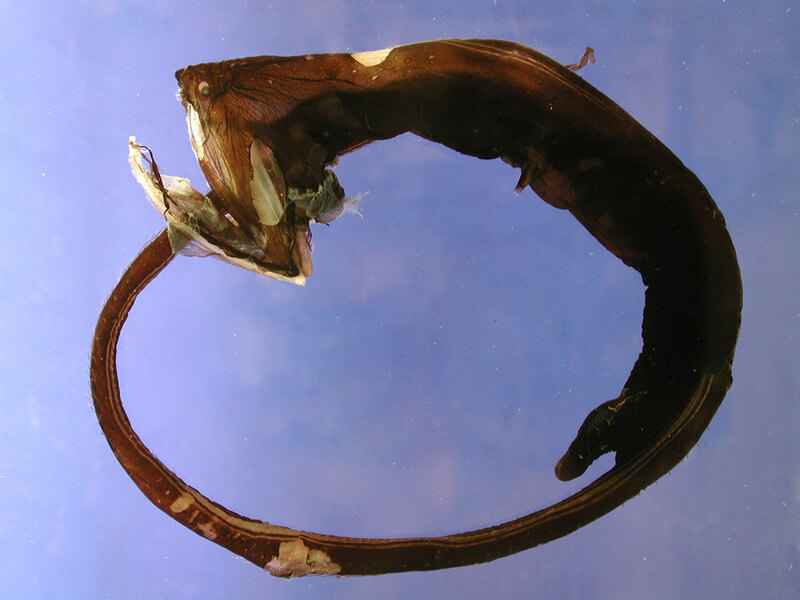 The other Gulper Eels are a little different, a little less extreme. They are known as Gulpers or Swallowers and there are 11 species of them in a genus called Saccopharynx, which means "sack pharynx". those are some funky fish! too cool! Funky and cool? I bet they'd be very pleased with that! Your first paragraph cracked me up. "A face that ugly shouldn't look that happy". Always a little unnerving when something that ugly looks pleased, isn't it? What are they plotting...? Yes! They're planning something... Maybe there's a Bond villain a couple miles down on the seafloor.